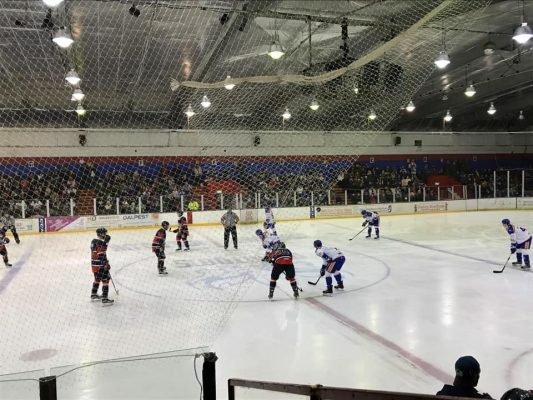 The Invicta Dynamos left Peterborough defeated but with their heads held high as they still look for their first point of the season. The first period was action packed and free flowing. Lewis English looked right at home on the top line with Callum Best and linked-up well with his new team mates. Phantoms’ netminder Jordan Marr almost presented Anthony Leone an early oppertunity after spilling the puck but it fell just inches beyong the Mos’ Captain. The Mos were soon defending a powerplay when Callum Best was caught cross-checking and sent to the penalty box for two minutes. Despite constant pressure in the Mos’ zone the Kent side defended well to see-out the penalty. When back at full strength the Mos pairing of Arran Strawson and Andy Munroe threw their bodies on the line in the 9th minute keeping the Phantoms at bay. Long then denied Glenn Billing on 9:54 and also pushed out another shot on 10:22 with ex-Dynamo Martins Susters fluffing the rebound. On 15 minutes Callum Best broke down the right flank and a clever pass found Lewis English who’s backhanded shot was blocked and the Mos then had Adam Long to thank at the other end when he denied a tipped shot from Glenn Billing slipping into the net. WIth the first period closing out an excahnge of words between Martins Susters and Arran Strawson showed Susters wouldn’t be getting any respect from the team he dumped earlier this season. The Mos were the brightest starters when the play got back underway with both Lewis English and Louis Colvin putting shots on Jordan Marr whilst at the other end Adam Long denied Ales Padelek on 21:58. With 22:33 on the clock Adam Long produced a double save with Ales Padelek again the man frustrated. A great chance was presented to Brandon Miles on 26:56 when a loose Phantoms pass found the Mos’ hardman who broke clear but Jordan Marr saved the day for the hosts. The Phantoms were given a powerplay soon after with Andy Munroe guilty of a cross check and when Martins Susters and Scott Robson combined they assisted for Corey McEwan to tap home at the far post for 1-0 on 32:33. It was soon 2-0 and again on a powerplay after Brandon Miles was adjudged to have high sticked James Ferrara who went down like a shot – Martins Susters and Corey McEwan turning providers for James White to score on 35:05. Susters claimed his 3rd assist on 37:21, squaring to Petr Stepanek for 3-0 and McEwan also claiming his 2nd assist. The Mos were angered at the end of the second period when Arran Strawson was floored by a late challenge which referee Pickett took no action from. The third period had Jordan Marr deny Arran Strawson and Harrison Lillis before the Mos were awarded their first powerplay on 48:47 with Jarvis Hunt guilty of charging. The powerplay was awful for the Dynamos with a warning shot at them when Adam Long had to save from Scott Robson. A great hit by Callum Best on Martins Susters was in vain with the Phantoms scoring on the shorthand through Petr Stepanek for 4-0 on 50:38 assisted by Corey McEwan. McEwan would later perform a massive hit on Brandon Miles which flew the Mos’ hard man into the air – Miles quickly returned to his feet and although words were exchanged matters didn’t extend any further. The Mos had one final powerplay given to them following a Taylor Romeo slash but the away side ended-up being shutout. This entry was posted	on Saturday, November 24th, 2018 at 9:00 pm	and is filed under Ice Hockey, Other Sports. You can follow any responses to this entry through the RSS 2.0 feed. Both comments and pings are currently closed.